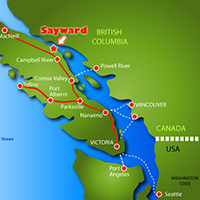 Sayward is located on Vancouver Island's beautiful east coast, on the inside passage, approximately 75 kilometers north of Campbell River. 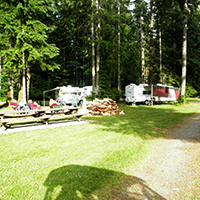 Sayward Junction, where Sayward Road meets Hwy 19 is approximatley 10 kms. from the Village of Sayward and Kelsey Bay. In the village there is a modern recreation center, a library, village offices, police and fire station and the area school. The marina accomodates local fisherers and tourists. There are not any services in the village or at the dock. The public dock is a great place to cast into the bay and catch salmon up to 40 lbs. While fishing, keep you're eyes open as seals, sea lions and killer whales may cruise by while eagles circle overhead. In the summer the Alaska cruise ships pass by almost within touching distance. Guided fishing tours are popular and guarantee great results. Check our event listing for more details, events. 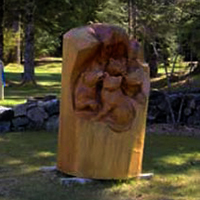 Walk through the park and enjoy the largest private collection of chainsaw carvings on Vancouver Island. Enjoy a leisurely walk to the Salmon River. Go to the end of the Park and cross Skogan Road. Just 15 meters and you will see the trail sign on your left. Follow the trail and enjoy the ambiance of nature and notice how the forest has regenerated since it was logged back in 1913. Takes about 15 minutes of easy walking each way. If the river is low, you can cross the side channel and get up onto the sand island. Stay to the right of the fence please. Continue in the same direction and you will come to the bank of the salmon river. This is a popular spot for fishing and picnics. Please stay on the trail as it is private property on each side. 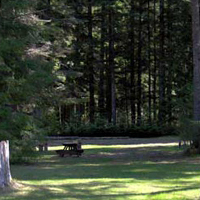 Stroll on 140 hectares of natural wonderland at the mouth of the Salmon River. At the sign to the Village of Sayward, turn right. Cross the logging road and park at the Estuary sign. There is an observation tower from which you can see waterfowl and local flora. 9km from Fisherboy Park. Rainbow's End Golf Course is Vancouver Island's newest privately-owned 9-hole golf course. Come and join us in North Island Paradise! There are a number of guided tours available in the area, including whale watching, bear watching, and sportsfishing. Check the link page for more info. Take a self-guided tour of giant old growth forest mixed with a variety of undergrowth and second growth fir and hemlock. If you're up to the challenge, consider joining us in June for the Annual Kusam Klimb, an endurance race that takes you to the top of Mt. H'Kusam's steep incline and then back down again. You'll wind your way through beautiful old growth forest where the breathtaking views of the Pacific Ocean and surrounding snow-capped mountains will be your reward. Catch your breath, take it all in, and then make your way back down the mountain to the finish line! 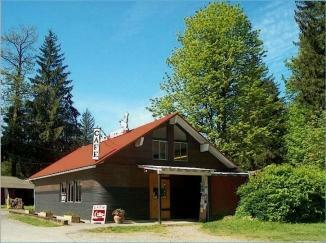 Enjoy a delicious breakfast or lunch, at this unique steel-frame building made entirely of used logging cable. Known for it's homestyle cooking, large portions and unique collection of antiques. World famous H'kusam Klimb: The Kusam Klimb is a wild and rugged 23 km loop heading up and over Mount H’Kusam and down the Stowe Creek watershed. 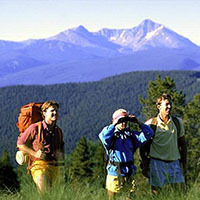 Test yourself against other klimbers in the annual race or just enjoy a strenuous day long hike. 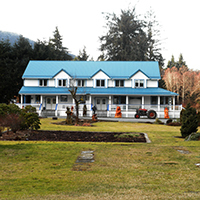 Sayward Valley Resort is centrally located to explore the North end of Vancouver Island. Only 2 hours ride to Port Hardy, or drive to Port Alice , Telegraph cove and many other wonderful locations waiting for you to explore. Park your bike in front of your cottages, and relax on the porch with your favorite beverage. 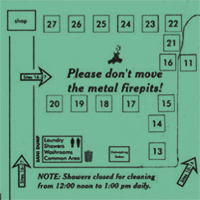 Fire pits available if desired. 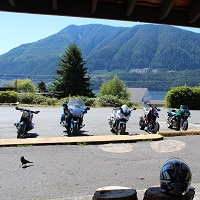 Other fabulous rides include Gold river, Tahasis and the Port Renfrew loop. 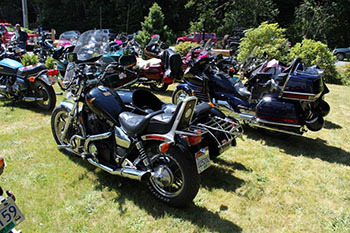 Sayward Valley Resort is motorcycle friendly. Several guides service Sayward as well as a charter service. Fishing licenses and tackle available at the store at Fisherboy Park. 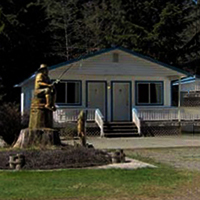 Whale and Grizzly bear watching available at world famous Telegraph Cove and at Campbell River. Ocean kayaking and nature watching available in Telegraph Cove.